We could almost imagine the scene there and then: horse-drawn carts loaded with large chunks of beef and pork, clattering noisily on the hard cobbled stone surface, making their way into the market hall and their respective stalls. The squishy sound of meat sawing mingled loudly with the almost aggressive haggling noise between the wholesalers and customers. The boisterous cries of weights and grades, the rowdy and unapologetic comments from retailers attempting to strike the best bargain of the day, the stern voices of meat inspectors trying to enforce orderliness amidst the chaotic circumstances, the confusing yells of instruction and warning from the market caretakers; It was an insane mess, but at the same time, natural and befitting to the bustling market surrounding. After operating as a meat market for almost 94 years from 1880, the building gradually lost its appeal as the perfect market venue. Tighter health regulations enforcing the distance between exhaust fumes from petrol driven vehicles and the meat stock meant the building could no longer serve its original function. This resulted in the eventual closing down of the market in 1974, thereby ended the era of a frenzied meat market in this beautiful Victorian building designed by the famous George Johnson (also the architect for the North Melbourne Town Hall). The heritage status of the building was registered 17 days prior to its appointed auction date. In other words, the market hall would need to be preserved and no demolition plan would be allowed. Potential bidders were aghast and lost all interests in the purchase. The market, unable to be sold, was then leased for various purposes, including being used as a car park. Numerous feasible uses were considered throughout the years, and there were no lack of prospective buyers eyeing the charming outlook of the building thoughtfully from time to time. To cut a long story short, the state government of Victoria purchased the building subsequently at the price of $890,000 in January 1977. The building was first served as a Craft Centre. Financial crisis embroiled the centre in the later years, where tenancies were dropped and revenue was adversely affected, despite the annual state funding provided. 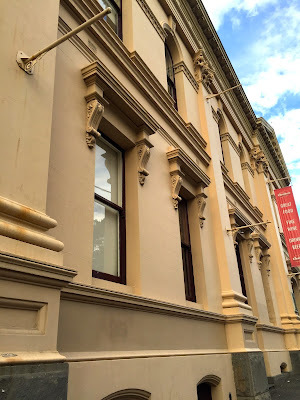 Today, the building is managed by the City of Melbourne, and is still serving as office and workshop accommodation for various craft organizations, artists and writers. The two pavilion spaces at the main hall are impressive venues available for hire for various purposes such as theatre performances, dance, markets, exhibitions, community events, conferences, and film shoots. Stepping into the historical building, we can still see the bewhiskered head sculpture of the founder and Chairman of the Metropolitan Meat Market Company, William Reynolds. The hanging frames for meat, the timber boards at the ceiling, and the original stallholders names are still clearly visible; As if the old meat market of yesteryear has not really left us, after all.